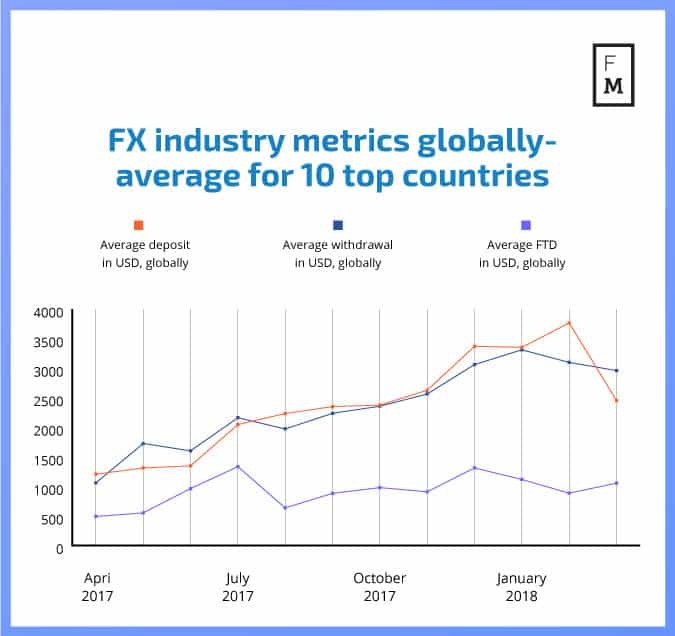 As the latest analysis by Finance Magnates’ Intelligence Department of data from CPattern shows, we are seeing the first significant decline following an almost year-long growth of the average size of deposits being sent to trading accounts by retail traders. 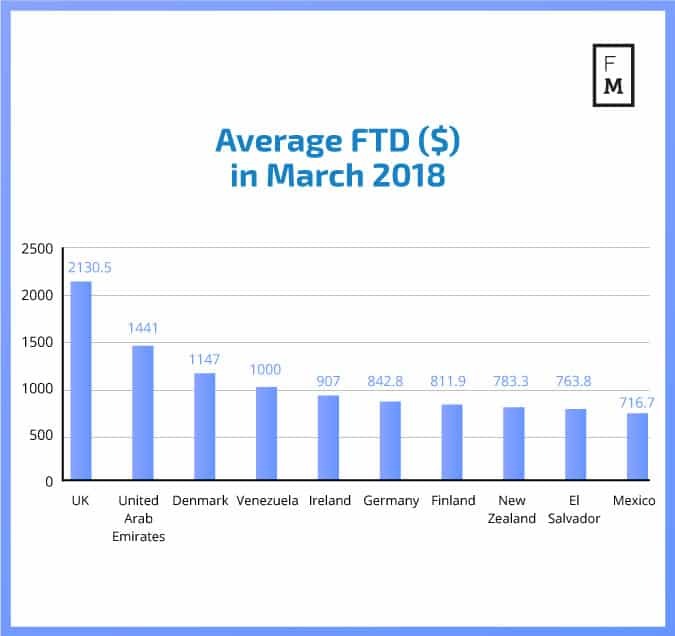 The average value for the top 10 countries decreased to $2,452 in March 2018 from a record $3,763 registered in February 2018. Also, the average withdrawal size fell from $3,097 to $2,959. When it comes to the average deposits being sent to trading accounts, the UK topped the ranks with a result of $4,670. Surprisingly, second place was held by Brazil, where on average retail traders were depositing $2,996. Considering the many restrictions on leverage FX trading, these results are surprisingly good. The third position belonged to Ukraine with $2,605, which also was a somewhat unexpected result. The UK was leading the ranks also in the area of the largest withdrawals per single trader. In March 2018, UK traders were taking $4,895 on average from their accounts per single withdrawal. 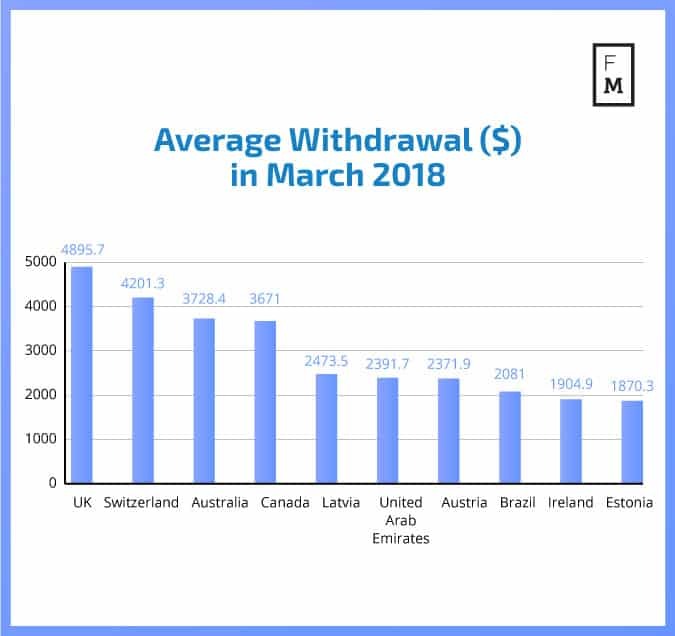 Second place was occupied by Switzerland with an average withdrawal size of $4,201, followed by Australia with $3,728.4. 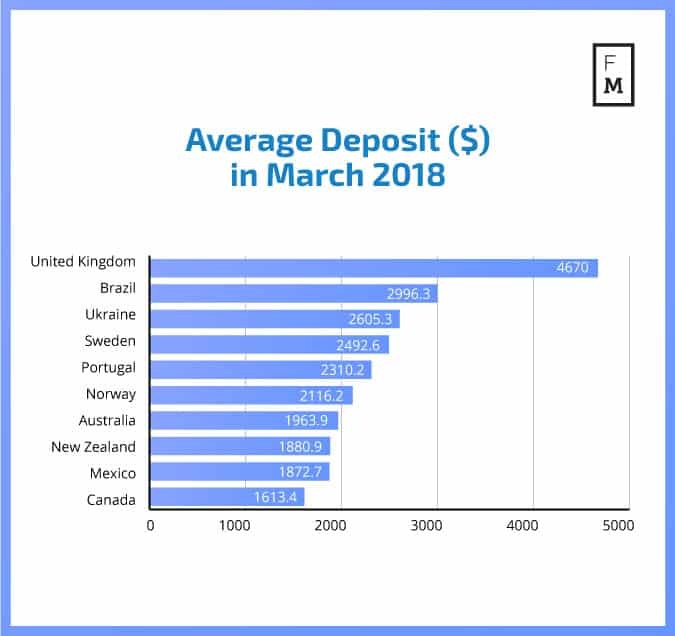 Unsurprisingly, the UK also topped the ranks regarding average first-time deposits (FTD) with a result of $2,130. Following behind were the United Arab Emirates with average FTD of $1,441. Third place was filled by Denmark, which rather rarely appears in our rankings, with an average first-time deposit of $1,147. This is the latest publication from the FM Traffic Indices – a new cross-industry benchmark. In today’s business world, big-data analysis and access to objective information sources are crucial to success. Unfortunately, until now, it has been very difficult and costly, if possible at all, to find any reliable benchmarks for operations in social, FX, binary options, and CFDs trading. For this reason, the Finance Magnates Intelligence Department has launched a new project, creating a set of indices encompassing various aspects of the online trading industry. These indices will provide you with unique data points gathered by our analysts, that will serve as a valuable knowledge base for your decision making.